I'm going to share a secret or two with you today. Don't get too excited. These secrets are not likely to change your life nor are these the kinds of secrets that you'll see on the cover of your favorite supermarket tabloid. Here's the scoop. 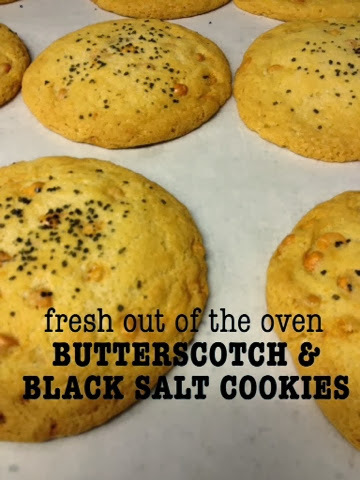 Butterscotch and black salt cookies are really easy to make. Take your favorite chocolate chip cookie recipe. Substitute butterscotch chips for the chocolate chips. Ta-da! Oops. My picture's upside down, but there's our recipe. Just make that chocolate chip cookie dough - using butterscotch chips - and make those cookies. Just before you put them in the oven, sprinkle black Hawaiian salt on the top of each cookie. Black salt, you say? Yes. It's actually black lava salt. You can Google it, kids. We first found it in those gourmet food sections of stores like T. J. Maxx, but more recently Mr. Beers found a source online. Craig and Cheryl and Emily Beers came to visit recently. We love when friends and family come to see us. Craig and Cheryl and Emily have been faithful San Antonio visitors for some years now, and we enjoy the chance to spend some time with them - share a meal or two, talk and laugh a lot - and they usually manage to make it by the deli for a visit and some lunch. One of the things Cheryl loves about coming to the deli is the picture wall(s) at the back of the dining area. 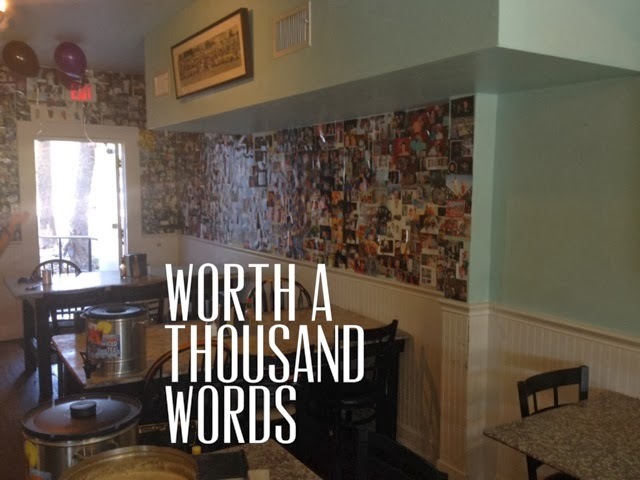 The walls are covered with photos of friends and family. There are pictures of the deli staff (past and present), college and high school friends, family members, friends, customers... Not too long ago one of our staff was able to show us all pictures of himself on the wall - when he was eight years old.